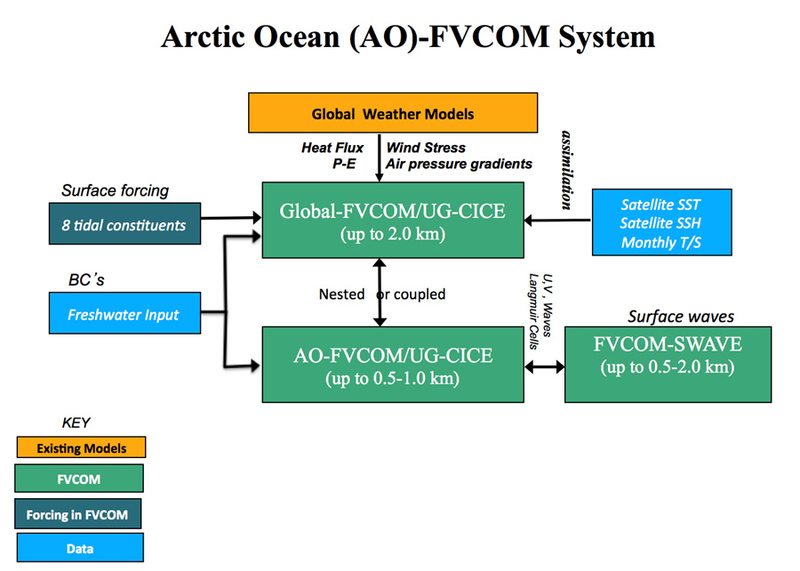 The Arctic Ocean FVCOM (named AO-FVCOM) is a high-resolution, unstructured-grid, finite-volume ice-ocean fully coupled regional FVCOM system nested with Global-FVCOM. The governing equations are discretized using flexible non-overlapped triangular grids with a resolution up to 0.5 km in narrow channels in the Canadian Archipelago in the horizontal. A hybrid terrain-following coordinate is used in the vertical, with a total of 45 layers. In the region deeper than 225 m, the s-coordinate is used, with 10 and 5 uniform layers near the surface and bottom, respectively. 225 m is an isobath to transfer to the sigma-coordinate in the shallow continental and coastal regions; at this location the thickness of all layers is 5 m. This hybrid coordinate prevents numerical errors in the simulation of surface mixed layer and bottom boundary layer dynamics in the interior without losing vertical resolution in the shallower coastal regions. This model system includes a) an unstructured grid version of the Los Alamos sea ice model Community Ice CodE (UG-CICE), b) hydrostatic and non-hydrostatic dynamics (NH-FVCOM); c) an unstructured-grid version of the Simulating Wave Nearshore model (SWAN) (named SWAVE), d) 3-D wet/dry point treatment, which can simulate flooding/draining processes in estuaries and wetlands; e) 4-D nudging, OI and Kalman Filters data assimilation algorithms; f) the mass conservative nesting module to integrate multi-domain FVCOM domains; and g) the MPI parallelized visualization tool ViSiT, which allows users to monitor model performance during the simulation and post-process the model output data. An updated version of AO-FVCOM also is capable of simulating the ice imbedded in the ocean.